If you’re looking for a new and comfy budget hotel in Oslo, then Comfort Hotel Xpress near to Youngstorget has you covered. 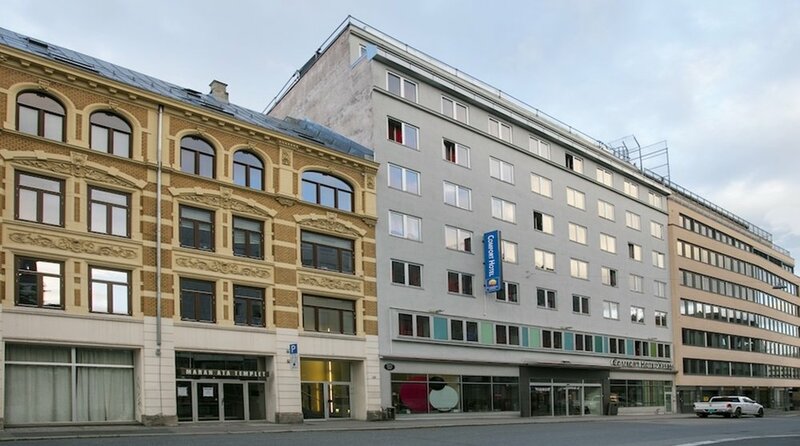 Starting from around 700 NOK/night for 2, the Xpress offers incredible value for an Oslo hotel. Youngstorget is an excellent location, close to the “budget-gourmet” restaurants of Torgata and some of Oslo’s best cocktail bars. Both the city centre and Grünerløkka are just short walks away. Check-in is self-service, free Wi-Fi is available everywhere, and there’s a gym, rooftop, laundry and small shop. It’s even pet friendly for those of you that like to take Rex on holiday. Everything is open 24/7 so you can run on any schedule you like. Best of all, you can have a big Saturday night without the stress of an early check-out the next day. You can keep your room until 6pm on Sunday at no extra charge. The Xpress offers 175 rooms, for just 1 or 2 people, either in a double or single beds. The rooms are compact, varying from 10m2 for a single, 12-16m2 for a double, and up to 18m2 for a twin. The design throughout is modern, stylish and minimal, yet with enough amenities to suit most needs. All rooms have a high def TV. If you like to work out of your room, avoid the single rooms as they lack a desk - you can usually get a double for the same price anyway. The hotel is just 6 six years old and has been designed for the modern traveller, whether you’re in Oslo for business or to let off some steam. If you’ve stayed in a Citizen M hotel and enjoyed it, you’ll feel at home at the Xpress. If there’s a flaw to the hotel’s style it’s that it simply tries to hard. There’s no subtlety in their communications and it gets a bit much. I mean it’s called “Xpress” for starters. You can’t spend a second on the website without reading about how “trendy” and “edgy” the hotel is with its “cool colours”. There’s even a pinball machine in the lobby so you don’t forget just how trendy it is. I’m a big fan of Citizen M hotels and the Xpress by extension. All you really need for a city break is a comfy room where you can recharge and plan your next move. At the Xpress you don’t even have to talk to anyone at check-in. With the details on your phone, you can walk right to your room and use your mobile to unlock the door. Of course there’s always someone to help if you need. You also don’t feel obliged to eat a dodgy buffet breakfast or worry about when housekeeping will come knocking. If you want a snack and can’t be bothered leaving the hotel, you can grab something from the lobby - any time of the day. Even better, if you have some leftovers or picked up something from the supermarket, you can heat it up in the microwave. If you’re in town for just a couple of days, housekeeping won’t come into your room. They clean only every four days (and between guests of course) because who really needs their room cleaned everyday? It’s an awesome way to keep costs down in a city where labour costs are high. Due to it’s proximity to some of Oslo’s best night spots, there can be a bit of noise on the weekends. But by picking a budget hotel hopefully you have a bit more cash to get out and visit the surrounding cafés, restaurants and bars. Most of the sights can be reached on foot and public transport connections are not far away. The Xpress is quite popular so make sure to book in advance. A web special is available if you book and pay online up to 21 days before arrival. You’ll frequently get good rates on Sundays and weeknights. There is another Xpress located at the central train station, which also offers some slightly fancier rooms and slightly higher prices to match. Price: From ~700 NOK/night for 2 people and from ~650 NOK/night if you’re travelling solo. Address: Møllergata 26. 10 minute walk from the central train station.